Tickets: $12 ($15 at the gate) general admission / $17 ($20 at the gate) reserved seating — can be purchased through Ticketmaster.com. Gates open 60 to 90 minutes prior to kickoff. All patrons will enter the stadium from Church Street. Baker: Defeated Cottondale, 56-6, in regional semifinals; defeated Graceville, 21-14, in regional finals; defeated Blountstown, 20-19, in state semifinals. Pahokee: Defeated Newberry, 35-34 (OT), in regional semifinals, defeated Trenton, 47-28, in regional finals; defeated Madison County, 21-19, in state semifinals. Baker: Ranked No. 2 in Class 1A by Joe Pinkos; Receiving Votes in Class 1A by The Associated Press. Pahokee: Ranked No. 3 in Class 1A by Joe Pinkos; Ranked No. 2 in Class 1A by The Associated Press. Baker: 24 state series appearances, four state titles, two runner-up finishes, 35-19 overall playoff record. 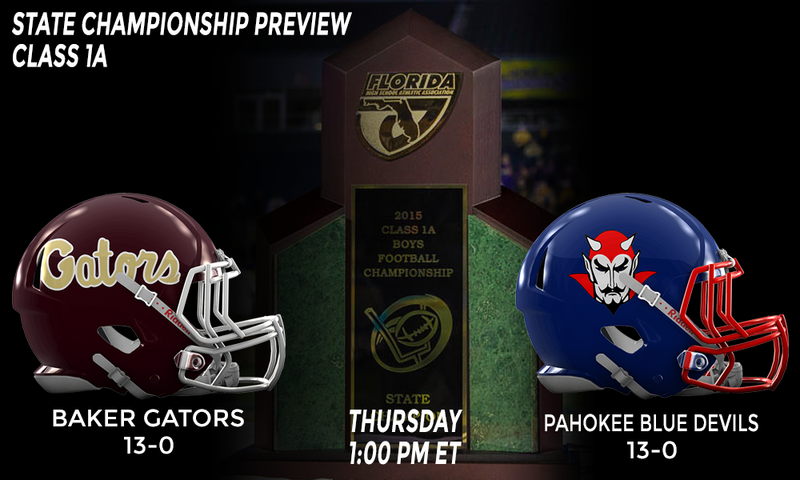 Pahokee: 28 state series appearances, six state titles, three runner-up finishes, 55-20 overall playoff record. QB Tyrone Smith, Pahokee, Sr. — Smith might be one of the best quarterbacks this season in Class 1A having completed 137 of 240 pass attempts for 2,366 yards and 25 touchdowns. Smith will certainly be a player to keep an eye on as he will a pair of receivers in Tyron Arnett and Adarius Dent he can throw to. RB Jalen Ciurleo, Baker, Jr. — One-half of Baker’s two 1,000-yard rushers this season, Ciurleo is a big offensive weapon for the Gators. Not only is he the team’s leading rusher (1,155 yards and 12 TDs), but is also the team’s leading receiver (27 catches, 470 yards, 5 TDs) and that will make him a serious threat for the Pahokee defense to try to contain during the game. CB Archie Johnson, Pahokee, Sr. — Johnson has been a big weapon for the Pahokee defense having collected up 25 tackles, 9 pass breakups as well as forcing a fumble and intercepting one pass. His presence on the field will be felt by Baker, possibly forcing them to throw away from him at any point during the game. WR Tyron Arnett, Pahokee, Sr. — Pahokee’s leading receiver, Arnett has been described as having great hands, can run great routes and can help be explosive after catching the ball. He will be called upon often by QB Tyrone Smith often during the game to get the ball down the field. LB Logan Rickman, Baker, Sr. — The leader of tackles for the Gators (107 tackles, 63 solos), he will be called upon to help shut down Pahokee’s offense, which won’t be easy to do. However, if he can make life miserable for the quarterback, it could favor the Gators to win the state championship. This is Baker’s first state championship game appearance since 1993. That year they defeated Fort Meade for the Class 2A state championship at Daytona Beach Municipal Stadium. However, head coach Matt Brunson is no stranger to the state championship life having lead Crestview to the Class 3A state championship game in 2002 (22-0 loss to Rockledge), but more importantly was on the state championship teams for Baker in 1984 and 1985 under legendary head coach John Ensor. While this might be Baker’s first state championship appearance in 23 years, there has been a consistent build up leading to this since Brunson was named the head coach in 2011. The last two years speak to that fact as the Gators have finished no less the regional finals, reaching the state semifinals last year before falling to Port St. Joe. Offensively speaking Baker is more of a run-dominant team, lead by two, 1,000-yard rushers in Jalen Ciurleo and Junior McLaughlin. They have been a proven threat to every team Baker has faced this schedule, including the rematch with Blountstown in the state semifinals, and they will certainly be called upon to put Pahokee’s defense on its toes. However, do keep an eye on quarterback Kalee Ciurleo who has thrown for 1,137 yards so far through the state semifinals with 17 touchdowns and only one pass being intercepted. Defensively, keep an eye on linebacker Logan Rickmon who is the team’s leading rusher. He will team up with linebacker Zach Brown and defensive lineman D’Nick Thomas between all three are the leading tacklers and/or sack leaders for the Gators. The combination of these three should help put pressure on Pahokee’s offense, something that will key for the Gator to winning the first state championship since 1993. It is a season of firsts for Pahokee, as it is the first state championship appearance in eight years for the Blue Devils, plus it is the first season at the helm for head coach Orson Walkes. Walkes, a Pahokee alum, took over the reins of the Blue Devils program back in March of this year after Alphonso Smith was dismissed last year in his lone season as the head coach. For Walkes though, this is familiar territory for him as he has been a part of the Pahokee program as a coach and a former assistant athletic director going back to 2004, which was down the stretch when the Blue Devils were one of the most dominant teams in the state. Looking at the offense, keep an eye on the passing game as this will be likely the best way for Pahokee to take down Baker. Watch for Tyrone Smith at quarterback who has thrown for over 2,000 yards and 25 touchdowns so far. He has a pair of wide receivers in Tyron Arnett and Adarius Dent who will challenge Baker’s linebackers and defensive backs. However, if the Blue Devils need to mix things up, they certainly can do that with running back Rodney McKay being the go-to guy. McKay has already rushed for over 1,300 yards this season, scoring 17 times on the ground. Defensively speaking, the Blue Devils are going to be relying on senior Archie Johnson to create trouble for Baker’s offense. Johnson has been known to create trouble for teams in the passing game and this could be a factor if Baker wants to attempt passing the ball during the game. Put Johnson as the “X-Factor” as to possibly causing the game to swing into the Blue Devils favor at any point during the game. Also keep an eye on sophomore Deante Nelson who has been responsible for two game-ending interceptions this season against Boca Raton and Madison County.